I hope you enjoy the peek into our lives through our pictures. I've never known a time without dogs in my life. Daddy raised and trained bird dogs and Mama raised poodles when I was young. Throughout the years, we had many different breeds, including a basenji, pointers, a Belgian shepherd, a labrador, poodles and a very smart schnauzer. All of them were special in their own ways. When I was 8 years old, my older brother brought a dog training book home from the school library. I was hooked! I started training any dog I could get a hold of. 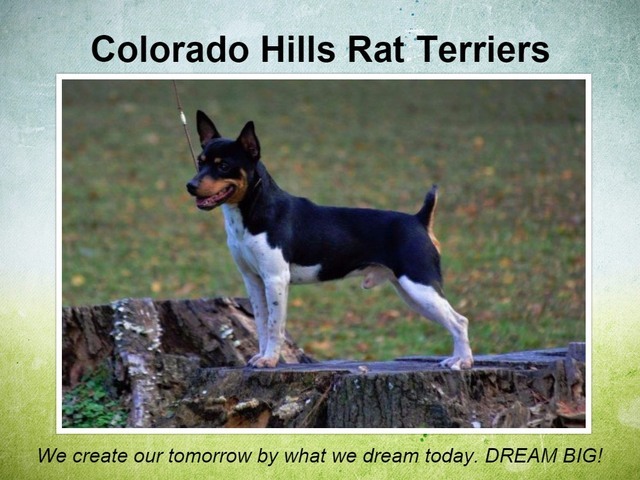 I got my first Rat Terrier from my Mama in 1991. I've been in love with the breed ever since. I've been involved in AKC, UKC and NADAC agility since 2000, in UKC conformation since 2003, and in AKC conformation since 2010. We started competing in Rally Obedience in 2009, and in formal obedience in 2013. With the help of several really talented dogs, I've managed to put over 110 titles on them. We show and compete mostly in the Southern states, but occasionally make trips to meet other people across the country. I am a dog lover, owner and trainer above all else. But, occasionally, I will have a litter of puppies. Each litter has been planned well in advance... sometimes up to three or four years in advance. Pedigree indicates what the dog should be. Conformation indicates what the dog appears to be. Performance indicates what the dog actually is. If you have any questions or comments, please contact me at COHillsRats@aol.com. 1 - 7 of 7 Total. These are the litters that are planned for 2019. If you are interested in a puppy, please CLICK HERE to email me at COHillsRats@aol.com. Thanks! I have put over 130 performance and conformation titles on my kids. Here are some pictures of each of them enjoying the game.